Children love to play. This truth will always remain a timeless classic, and it holds true over all species of animals. But there is more to this childhood state of mind; it comes with an openness to new ideas and new friends. As one proud owner found out, children love to play with each other – even when they come from different species. This owner had an adorable four month old puppy. The pup is already sweet and mild-mannered, but he is about to learn so much more from his new friend. 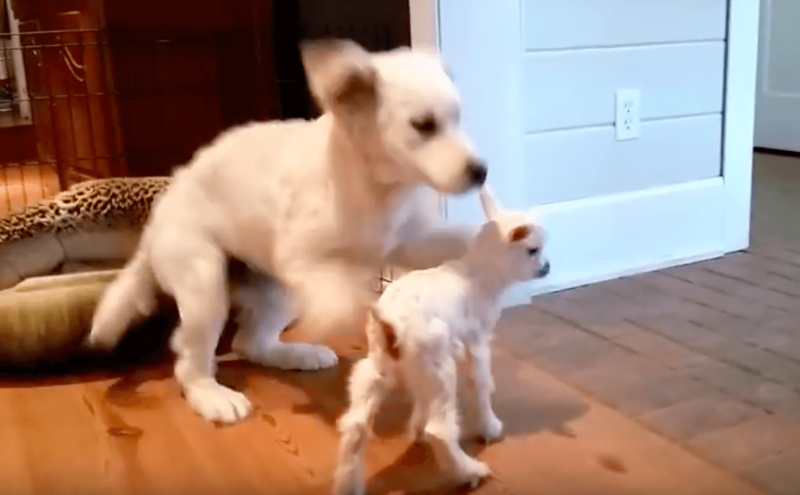 Recently, the dog’s owner has gotten a tiny baby goat. This goat was only four days old, but he was ready to meet the puppy. The two were so cute already, of course they would be adorable together! Still, the owner must have been a little anxious to see what would happen when she put the two in the same enclosed area. She took out her video camera and prepared to find out. The two immediately took an interest in each other. They each extended their snouts, trying to figure out what the other animal was. Then the baby goat explored the new environment. The little guy was curious about everything he saw – and tried to sniff it all. The puppy, however, was still fascinated with the goat. Who was this new friend, anyway? 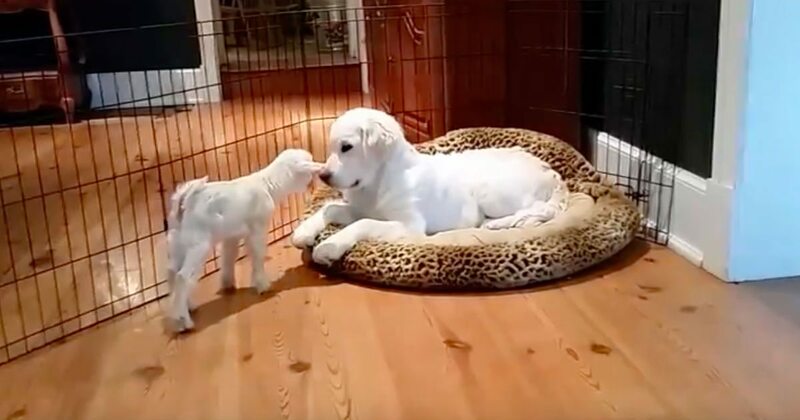 He watched, from a distance at first, but slowly the goat made his way back to the pup. They bumped their noses against each other in a sweet display. 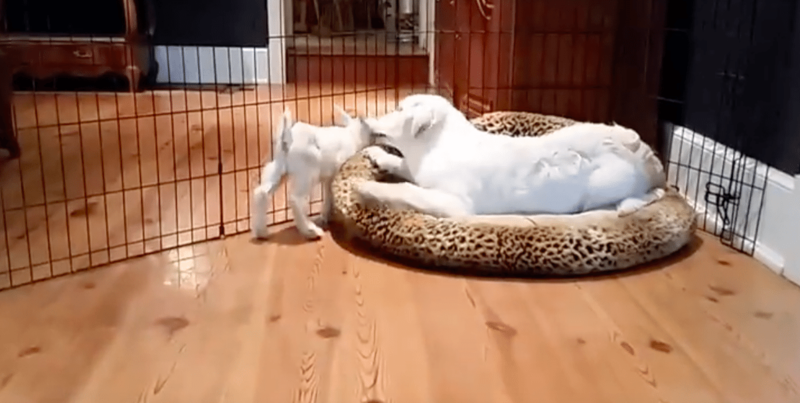 When the goat got distracted and walked away, the puppy couldn’t take it! He bounded over, jumping in the little goat’s way. The puppy wanted to play with him. 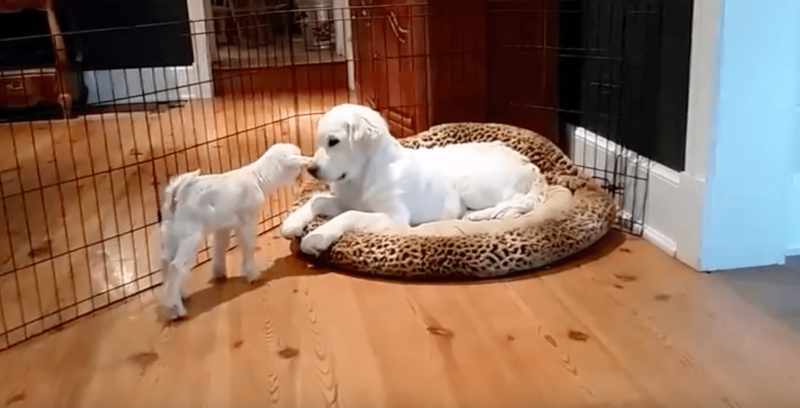 As the goat hopped around the room, the puppy dog’s tail wagged faster and faster. The pup turned into a white blur as he rushed around the room. He was going so fast he couldn’t stop himself – he kept sliding on the wooden floor, comically crashing into furniture and his doggie-divider. 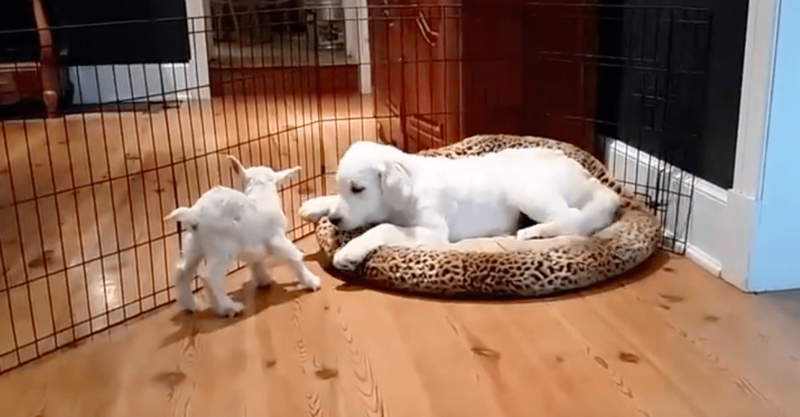 All this puppy wanted to do was play with his new goat friend. He excitedly circled around the goat. He even nibbled at his ears. This dog was determined to have the new guy join in on the fun. After hopping in a frenzy around the room, the puppy finally accepted the calm demeanor of the baby goat. These two are going to make quite the team when they get older. This adorable duo proves you don’t have to have much in common to become great friends.